This year I’ve been learning lots about the importance of eating a diet heavy in fruits and vegetables. I even found out a thing or two about juicing and how beneficial it can be. Still, it took my upcoming summer vacation to finally get me motivated to lose some weight. I’ve been telling myself how great it would feel if I could just lose the 7-10 lbs. that have been keeping me from looking my best. There are all sorts of reasons why I fell off of the exercise wagon so I’ll save the long story. Thankfully my diet only needs a few tweeks here and there because my family and I eat pretty healthy. After watching the movie, “Fat, Sick and Nearly Dead,” earlier this year, I decided to start juicing more. At first, there was a bit of a learning curve but I’m used to it now and can whip up a glass of juice for breakfast with no extra fuss. I’m happy to say that it helped with my psoriasis which was crazy out of control for most of the winter. 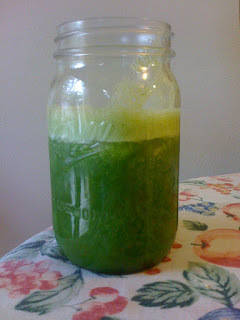 One of my favorites is a green smoothie with Kale, Cucumber, Apple and Banana. Now that my skin is looking better, I’ve been trying to exercise more in hopes of losing a little extra cushion around the middle and thighs. Don’t get me wrong, I’m thankful that I’ve been around the same size for years. It would be nice though to not have to rely so much on help from shaperwear when it’s time to dress up. Plus, I want to have more energy to help me get through these long summer days with the kids. As for my hair, I’m hoping that the cardio and strength workouts will lead to a faster metabolism. This in turn can lead to faster hair growth (maybe). So for now the Wash n’ Go hairstyle is super easy for me. Since I use a heavy gel product like Eco Styler, I can just wet my hair in the shower to reactivate my style. Co-washing is also pretty easy because it removes most of the product without stripping my hair or causing my curls to go into shock. Sometimes I even use a light oil on my hair either in the shower or right after to seal in the moisture and combat dryness. The wash n’ go style is so much easier now and great for the summer.